For those who will be born in the upcoming year, 4714 of the Lunar Calendar, they will more specifically be “fire roosters” “or “red fire chickens.” In one place online, I read that according to more specific info, 2017 is actually a female, or chicken year. We are seeing a lot of roosters and chickens as we are out and about, although they don’t seem as plentiful as some of the other zodiac animals in previous years have been. My picture shows a live chicken from where we live, some rooster statues from a Spring Festival Flower Market, and lots of cute plush chickens from the display window of our local variety store. Life in China 2016: A Picture A Day, September 3 – It amazes me how quickly things can change in China! I can go to my “home” in the USA, and even if I’ve been gone a year, hardly anything is different. Not so here! 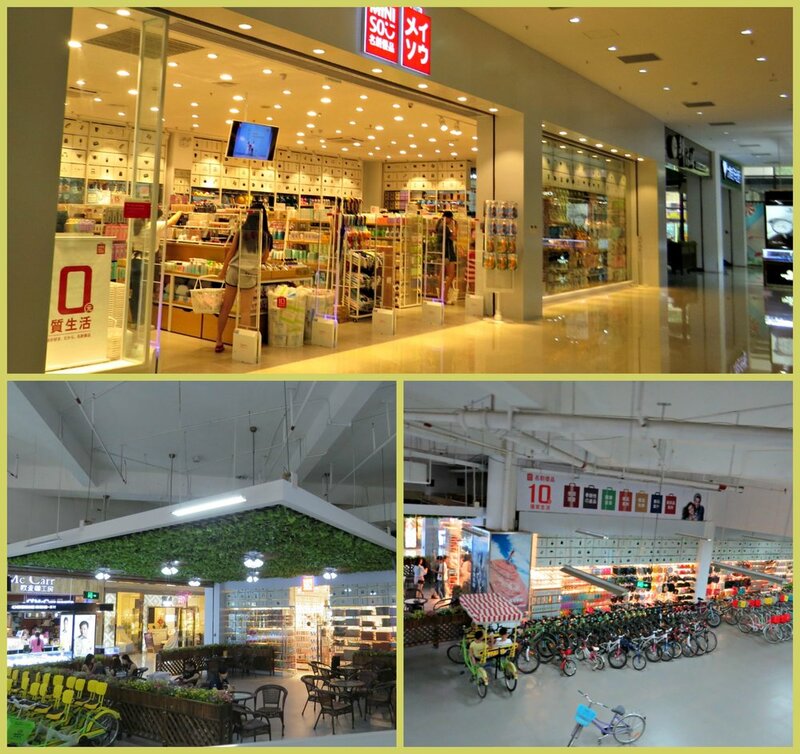 We were in the Philippines for 2 ½ weeks and there is now a new store! This is right by the entrance of the local supermarket, so I’m there at least twice a week, and I saw no signs of something new being built before I left! So it was quite a surprise to see it on our first day back! It’s a nice little Japanese brand shop with some nice things :-) I took the bottom 2 pictures as I was coming down the escalator from the supermarket, so you can see it would be hard to miss, the area used to just be open! The new store has glass walls on three sides, with everything around it still the same, bicycle rentals behind it and a drink and snack place to the side. I guess this was just a simple little store, but skyscrapers also go up in an amazing amount of time! Life in China 2016: A Picture A Day, June 9 – The 5th day of the 5th month of the lunar calendar is when the “Double Fifth,” also called the Dragon Boat Festival, is celebrated in China. It is celebrated to honor a poet named Qu Yuan. In modern times, dragon boat races are held in many cities worldwide. In China, people also eat “zongzi” which are dumplings made of sticky rice with either sweet or savory fillings. They are wrapped in bamboo or other large leaves. My favorite have red bean filling. Since we knew we would miss the festival and the fresh dumplings, we had bought some frozen ones to enjoy before we left China. Life in China 2016: A Picture A Day, June 1 – International Children’s Day is celebrated on June 1st in China, as well 46 other countries worldwide. When we first went to China I was surprised to learn about it since I had never heard of Children’s Day in the USA, although Wikipedia says it is celebrated in the USA the second Sunday in June each year. There are also many countries that celebrate Universal Children’s Day on November 20. Our first Children’s Day in China was just a few weeks after we had first arrived in China and Leah was invited to attend the activities at a local elementary school. The children first did their morning exercises and a program, then the rest of the morning had a carnival type set up with games to play and activities to participate in. At the end, each child received a treat bag. These pictures are from 2009. Life in China: A Picture A Day, April 4, 2016 -Today was an official holiday in China, called Qing Ming Jie 清明节, or Tomb Sweeping Day/Festival. It is a day/weekend celebrated by Eastern religions to pay respect to your ancestors, clean their graves, burn incense and make offerings. I’ve never actually seen a grave in Guangdong province, they are outside of the city. I have seen them when we were at the rice terraces (which is pictured) and also driving through the New Territories of Hong Kong. Since they are in the countryside, families usually pack a picnic to enjoy after tending to the graves. Nowadays, since so many people aren’t in their hometowns where their ancestors’ graves are, you can hire someone to tend to the graves for you. I thought it was interesting that those people who are specifically remembered are considered part of the extended family and called the “living dead,” whereas those who have been forgotten by their families are considered to be ghosts or the “dead dead.” The belief is that you can send things to these ancestors by burning a likeness of the object, so, as you can see by the pictures, you can buy paper money, houses, cars, games, jewelry and even iphones and ipads! My favorite is the package with Hades tea and beer! Leah took these pictures yesterday at the wet market in Dalingshan, the town next to us.